THIS EVENT IS FREE AND OPEN TO THE PUBLIC. THERE IS NO REGISTRATION NECESSARY. Both venues have a capacity of 200. Entrance is on a first come, first serve basis. 10:30-12:00 Solidarity Economies A number of alternative economic practices such as cooperatives, participatory budgeting, alternative currencies, social enterprises, and the like prioritize ethical considerations, equity, democratic process, and community-based development. In some countries, these organizational forms and practices have begun to coalesce into a self-identified solidarity economy. This panel examines how such a development approach generates substantial social and economic effects in communities in Quebec, Philadelphia, and New York City. 1:00-2:30 Labor This panel will bring together organizers who have worked with taxi workers, domestic workers, and day laborers in NYC and nationally. We will discuss the common points of struggle and the differences between these groups, as well as the challenges of organizing. We will look at the potential for these excluded workers to create a vital anti-capitalist alternative. 2:30-4:00 Housing The arena of land and housing is one space in which we can see relations of Capital at work. New York City has been the site of massive redistributions of land and housing during the recent recession, and rent continues to climb. Can we transform the legal system? Can we address land and housing as a needs-based right as opposed to a market commodity? This panel discusses on the ground organizing around housing, and seeks to critically address what an anti-capitalist housing movement could look like. The Premise of the Common(s)/ The notion, horizon, and premise of the common(s) is emerging as a significant category for political struggle. From struggles around food, to work, to housing, to internet, to larger ecological questions; the common(s) seems to be both a shared ground and point of conjunction for many movements globally. But any struggle for reclaiming common(s) or conjoining around a common(s) movement also carries with it some risks. This session will be dedicated to collectively mapping out the necessities and risks of bringing together disparate struggles toward a common(s) horizon. 6:00-8:00 The Contradictions of AntiCapitalism; W(h)ither the State? While there is a general acceptance on the left that the capitalist state must either be smashed, ignored or eventually withered away, the role and form of non-capitalist state power (if such is conceivable) in the transition to and constitution of a future non-capitalist society is a controversial matter. While it is evident that in the current conjuncture the state is hopelessly compromised as a vehicle for the administration of capitalist class power, the need for large scale infrastructures and coordinations between associated workers and residential populations suggests that something like a cooperative or partnership state would be necessary to ensure not only the survival but also the progress towards a social order founded on anti-capitalist principles. 12:00-1:30 Living Sin Patron – The Recuperation of Life & Work Sin Patron (without a boss) describes a new social creation taking place around the world. Coined by people in the recuperated workplace movement in Argentina, it has come to mean not only working literally without bosses and hierarchy, but represents a new way of relating based on solidarity and the creation of a value system outside the framework of capitalist value production. This new way of working and relating is taking place in everything from metal and print shops, hotels and restaurants to emergent self-organized groups and collectives, from Argentina, Brazil and Greece, to Chicago in the US. 1:30-3:00 Urban Unions and the Redefinion of City Growth The concept of the labor union as a collectivized organizational form capableof leveraging better working conditions, as well as defending workers from some of the exploitative labor practices inherent in desires of owners of the means of production, has been present with different degrees of influence in all historical stages of advanced capitalist production. Today, unions in their diverse deterministic forms strive to be effective in the complex uneven urban context in which a large proportion of workers are embedded, which, more than labor itself, is now the determinate factor in the everyday struggle for a dignified and just life. Imposing urban variables like commuting time and expenses, displacement risks, infrastructure failures, food and housing accessibility, environmental hazards, gentrification processes and the perils of high stakes real estate speculation have made the battleground more apparent, from the spaces of work to the totalizing space of the urban. However, there does not seem to be any organizational form yet capable of unifying the fragmented activisms of its inhabitants into a common project for retaking the city. This panel will elaborate on possibilities of organizing and unionizing large number of inhabitants for taking control of the processes that produce their urban environment. It will ask, Is it possible to imagine organizing vast parts of a city? Can we imagine organizing beyond the prescribed silos of labor unions or the non-profit establishment into the complex ecology of the city as a whole? Could Urban Unions redefine city growth? 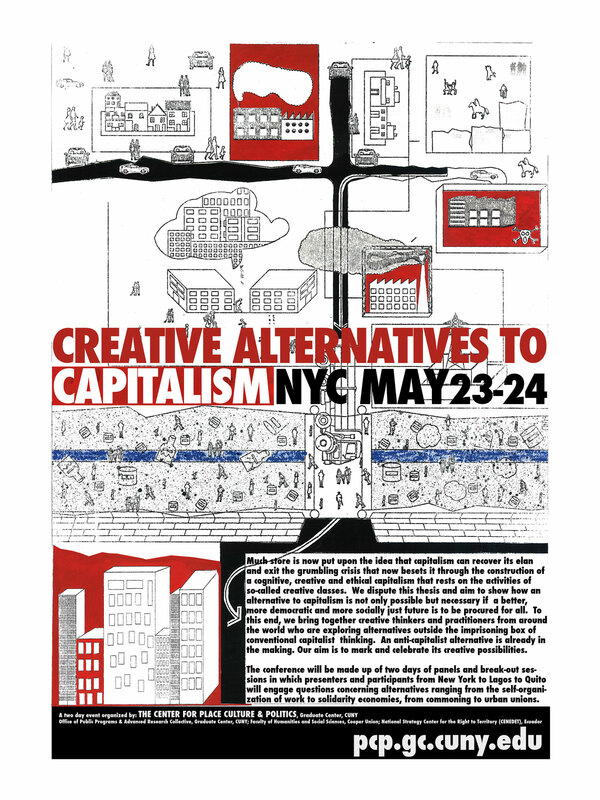 3:30-4:30 Commoning Commons-based alternatives to capitalism have been present from day one, they have often been regarded “as roads not taken,” but they are more accurately described as “roads blown up.” In this panel we will present some historical contextualization: the conjoining of the State and the Market against the Commons that has an origin which indeed questions not only capitalism but the geological epoch now named by many the “anthropocene”. We will discuss some commons-based alternatives to capitalism, with special emphasis on the Zapatistas who have definitely revitalized and scaled up the notion and practice of commoning. Their project now involves hundreds of villages, tens of thousands of hectares of land, and more than a hundred thousand participants. Their collective effort is one of the most creative alternatives to capitalism on the planet. In the last twenty years they have made it clear that they will cooperate neither with Mexican state agencies and political parties nor with capitalist firms. They argue (against many critics) that the commoning form of life they are developing cannot co-exist as a sector of a triune society alongside the state sector and capital sector. 4:30-6:00 Food, Land and Energy Struggles Control over land is central to relations of capital and anti-capitalist movements. People on the ground in communities all over the world struggle against displacement from land, and for the right to grow food and meet basic needs for survival. A growing movement of transnational resistance against governments, financial institutions and large corporations is pushing back, and uniting across continents. This panel brings together perspectives on and from movements that struggle around food, land and energy. In their struggles against a dispossessing capitalism, how do these movements also envision and model alternatives? 6:00-7:00 Transforming the City Any anti-capitalist movement has at some point or other to deal with the nature of urban life and social reproduction and seek out paths towards a radical transformation of social relations, of productive apparatuses, of ways of living and in the relation to nature. Experiments under way right now, some of which have been the focus of concern in this conference, pre-figure what a future social order might look like. But there is a need to bring many of these moving parts of transformation together around a more organic conception of city life as a whole and ask the question: what will an anti-capitalist city look like and what would it be like to live there? Final Discussion Over the course of the conference, several contributors of 16 Beaver Group will try to map out some key questions over the duration of the conference. In the evening, they will try to find a form in which these questions can be shared, considered, and addressed together. Hi! I’m from El Salvador and I’m interested in having access to the lectures given at this conference. Is there a link to a video that recorded the activities from both days, or anything else I could get access to? I am from Bosnia but would really want to watch the talks from this conference. Did you perhaps recored it? If yes, can you pleae share where I can watch it since the youtube link on website does not work…. What about a resource-based economy? How can you register for the conference? What is the cost? Hi. Is the event on May 23/24 public, or should we RSVP? Is it first-come first-serve?